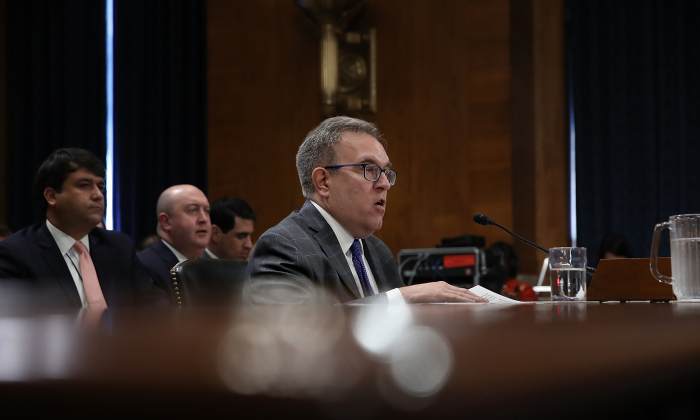 WASHINGTON–A key Senate committee approved President Donald Trump’s pick to lead the Environmental Protection Agency (EPA) on Feb. 5, putting acting Administrator Andrew Wheeler a step closer to becoming the permanent head of America’s top environmental regulator. Wheeler, a Washington insider with years of experience in Congress, was nominated by Trump last month to replace Scott Pruitt, who resigned in July after criticism for alleged ethical missteps. His nomination has cheered business interests keen to see reduced regulation, but upset Democrats and environmentalists. The Republican-controlled Senate Committee on Environment and Public Works voted in favor of advancing Wheeler’s nomination. A full Senate vote must now be scheduled to complete his confirmation. “Mr. Wheeler has done an outstanding job as the acting administrator over the past six months,” Sen. John Barrasso (R-Wyo), chairman of the committee, said. Sen. Shelley Moore Capito (R-W.Va.) said Wheeler worked to improve transparency at the agency. While running the EPA on an interim basis, Wheeler continued his predecessor’s efforts to strip away red tape on industry, including steps to ease Obama-era rules restrictions on power plant emissions and advancing an initiative to lift a summertime ban on higher ethanol blends of gasoline. During his confirmation hearing in January, Wheeler said he did not believe climate change was the greatest crisis–a stance that resonates with Trump’s skepticism. While the president and his allies are often criticized about their views on climate change, there is no consensus among the world’s scientists about the extent of the impact of human activity on climate. Trump has repeatedly cast doubt on climate change narrative promoted by media and has indicated his intention to withdraw from a global pact to fight it because he says would be too costly for U.S. companies. Virtually every climate change model tested in the last two decades has incorrectly predicted a rise in temperatures above what actually occurred. As of 2010, more than 1,000 scientists (pdf) around the world dissented with the global warming alarmists long held by the United Nations’ Intergovernmental Panel on Climate Change. By Humeyra Pamuk. Epoch Times staff member Ivan Pentchoukov contributed to this report.